Front Squats. I like ‘em. But man, it can be really hard to get into the position. So I tried a mobility routine from “Becoming A Supple Leopard” by Kelly Starrett of MobilityWOD for 14 days to improve my Front Rack Position. This is what happened. What is the Front Rack Position? The front squat position is called the front rack. It’s when you rack the barbell on your shoulders in front of you. The proper way to do it is like this. This is known as the clean grip. Sadly, the clean grip requires a lot of mobility to get into. I’d say from my experience, most people couldn’t get into the position at all and end up having to use a modified grip or even a different bar altogether! Here is what my front rack position looked like at the beginning. I’ll admit that I’m a naturally more flexible guy and that my front rack position was actually not that bad considering that I had spent pretty much zero time on any upper body mobility work for the last few months. But it still felt tight. The routine I used is from a book called Becoming A Supple Leopard by a guy named Kelly Starrett. He is a physical therapist well known in the CrossFit world and is the guy behind MobilityWOD. First mobilization is the 4 minute T-Spine Smash. 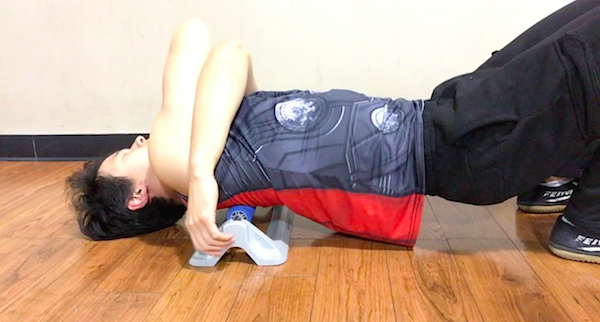 This is for improving thoracic extension, which is one of key parts of a good front rack. Ok it’s basically keeping your torso upright. I did all the different variations and used the MobilityWOD little battlestar. Which is basically a hard plastic roller with bumps. Next is the Super Front Rack, which looks exactly like what the name suggests. Great for improving shoulder flexion and external rotation, both of which are also important for a good front rack. A couple pointers are to keep your stomach tight, keep your palm facing up, and try to not let your elbow fly off to the side. You can use your other hand to help you. 2 minutes each side. 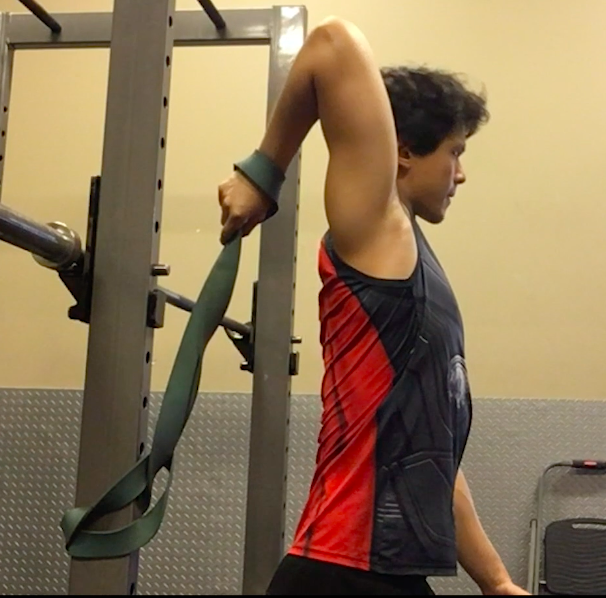 The third stretch is the Overhead Distraction with External Rotation Bias. Yeah, that was a mouthful. Just shove your arm in and grab the outside of the band. Keep your abs tight and keep your elbow close. Great for shoulder flexion. 2 minutes each side. Wrist extension is also an important part of the front rack position. However, I happen to have pretty flexible wrists. Hands backwards push ups are not a problem for me at all. So I think that pretty much rules out wrist extension as a problem. Therefore, I chose not to focus on wrist extension during these 14 days. After doing these exercises everyday for 2 weeks, here is what my front rack position looked like at the end. Keep in mind that for both the before and after, I tested the position with all four fingers around the bar. After the 2 weeks, it looks like I was able to get my elbows up a bit higher and improve my external rotation. The bar itself is also in a much more comfortable position relative to my neck and the position no longer feels tight. Overall, I’m pretty happy. Decent improvement for just two weeks. So if you’re someone with an ugly front rack position, try it out and let me know how it goes! If you’ve done other things to help with your front rack, let me know that as well! And no, no one is paying me to write this article. I just like trying out new things! I’ll be making more videos and articles like this in the future, so If you enjoyed this article, share it with a friend, subscribe to the mailing list (for weekly fitness tips) and follow me on social media using the links below! Sign up with your email address to receive fitness tips, motivation, news and updates.